When Madalyn Hovious first heard of La Casa, she felt hesitant to get involved. A transfer student from a small town near the Kentucky-Indiana border, Hovious experienced lingering fears that her half-Mexican heritage and lack of fluency in Spanish meant that she was not Mexican enough to get involved with a center that celebrates Latino culture and history. This all changed, however, once she spoke with the students and staff at La Casa. “They quickly taught me that, just because I don’t speak Spanish or just because I’m not fully Mexican, doesn’t mean I’m any less part of the Latino community,” Hovious said. Now a senior and a social work intern at La Casa, Hovious is a proud member of the community that calls the center a home away from home. 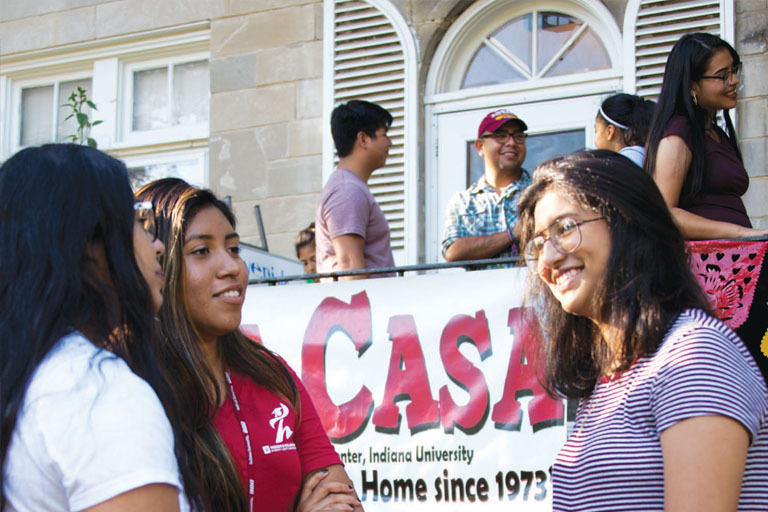 A center supported by the Office of the Vice President for Diversity, Equity, and Multicultural Affairs on the IU Bloomington campus, La Casa has been fulfilling this role since its founding in 1973. Now, as the center celebrates 45 years of work at Indiana University, students and alumni impacted by La Casa have reflected on the difference it has made in their lives. “This is a family, this is a home, and this is a place where everybody looks like me,” Hovious said. La Casa first opened in 1973, after Latino students lobbied for a center that could provide the Latino community with support and a collective voice in the university. In the years since, La Casa has implemented programming to meet these needs in as holistic a manner as possible. Much of this work is focused on providing students with resources and fostering community, whether it be connecting students to financial assistance or hosting monthly dinners where attendees bond over food and conversation.Through campus-focused programming and events like the center’s Dia de los Muertos celebration, La Casa also brings discussions of Latino culture and heritage to the greater IU Bloomington community. In doing so, La Casa seeks to engage members of the community from all backgrounds in celebrations of Latino culture. Through it all, the founding themes of La Casa remain central organizing principles of the work that the center conducts, said Lillian Casillas-Origel, the director of La Casa. “The basics are still relevant. We’re still working with students who are first-generation, we’re still working to make sure the campus is outreaching and inclusive, we are still helping to develop students for life after college,” Casillas-Origel said. Adrian Paneto is one such student who has benefited from this dedication. A second-year doctoral student studying counseling psychology Paneto first visited La Casa to connect with the IU Bloomington Latino community. There, he found immense value in the connections La Casa strives to foster, both with other students and with Latino faculty and staff. With a political climate that is hostile to racial and ethnic minorities, Paneto said, these connections offered much needed respite and community for Latino students — a fact he often sees when working with clients as part of his counseling practice. Alice Jordan-Miles, a 1989 graduate of Indiana University, remembered similar experiences from her time on campus. When she was a student, Jordan-Miles said, the Latino community made up less than 1 percent of the total IU student body. This, combined with the fact that she was the first in her family to attend college, made her transition to Indiana University extremely difficult. The relationships Jordan-Miles formed at La Casa, however, helped her overcome the obstacles in her way and graduate — a feat that set a precedent for six of her younger siblings to attend college. Now the president of the IU Latino Alumni Association, Jordan-Miles remains dedicated to replicating the success she found through her support system at La Casa. As a way to pay respect to her late high school mentor, Jordan-Miles started a mentoring program that has helped several hundred students attend college. She also works as a suicide prevention specialist, advocating for mental health resources at the state and national level. This work would not have been possible, she said, without the personalized and supportive environment that La Casa provided her as an undergraduate. “There’s a saying, La Casa should be called Mi Casa, my house,” Jordan-Miles said.